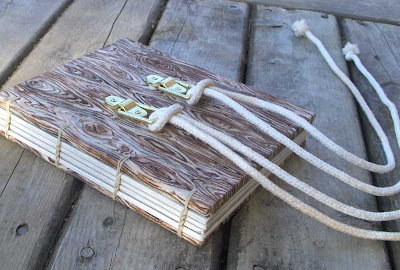 My first limited edition artist's book: Tying Knots. 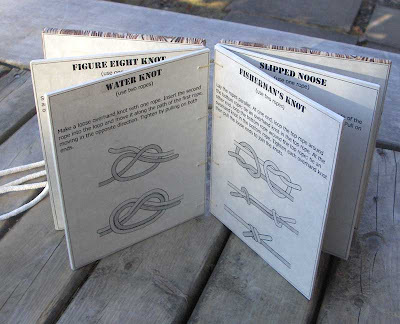 I created the illustrations and wrote the instructions for eight different knots, and used them to make this book. Actually I made two of these books, a very limited edition of two. The pages are eska board covered with laser printed parchment paper. The covers have woodgrain printed fabric backed with mulberry paper. Brass findings on the front cover are used to attach two ropes. The ropes can be removed and used to practice the knots, of course. The binding is a Coptic-type chain stitch. One of these books spent some time at Another Room in Alameda, California. I don't really think of myself as an artist either, but most of my books are blank journals similar to yours. I guess the closest I've gotten to an art book is the one I'm working on for the bookarts forum swap. Well that makes three of us. I did my first "art" or at least content book as a Christmas gift - actually a limited edition of 12 bone shaped accordion style books with dog limericks for my doggie friends. I've got several ideas for other books with content but none have yet gotten to the realization stage. Enjoy your blog especially the various bindings. So for the moment I'll just keep trying new bindings on blank books & refrain from being an "artist."